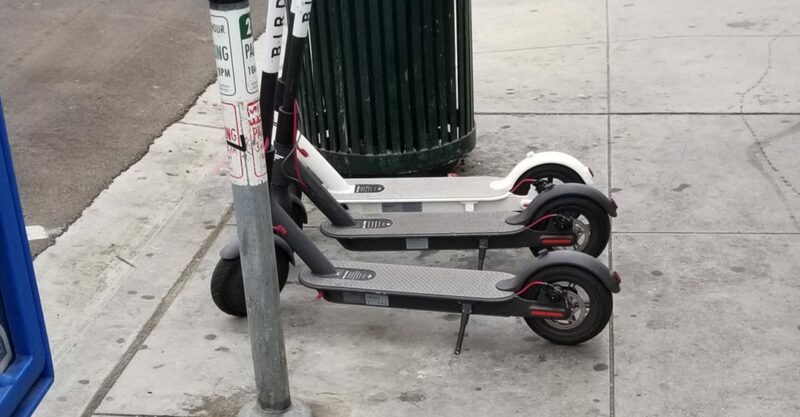 NOTE: It is irresponsible to block sidewalks and access ways with your scooter. Please encourage your friends not to be lazy and go the extra few feet to find a responsible place for them. We’ll all benefit. **This one is illegal, but there is a pending bill in the California state legislature to change it. That said, you can pick up a helmet for $1.99 if you have a credit card directly from the Bird App – I did, it was super easy. The image below was added to the initial app screen on about 8/22/18. It requires users to swipe through information that includes the things I mentioned above (except the fine amount). Good job, Bird. Please share this with your friends and neighbors and encourage your local elected officials to include a notice in those little bulletins they all send out. Also, there will be some people who want to check my work, so to speak. You can find the California Vehicle Code section HERE and the San Diego Municipal Code section HERE. You can (and should) also write your Councilmembers to share your perspective. Get their emails HERE.